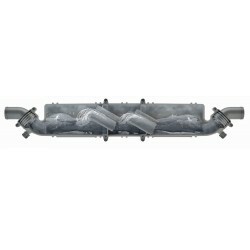 Waterlock/Muffler NLP31560 15L Dia. | Exalto Emirates LLC. Select Product: Waterlock / Muffler NLP3 Dia. 40 mm Waterlock / Muffler NLP3 Dia. 45 mm Waterlock / Muffler NLP3 Dia. 50 mm Waterlock / Muffler NLP360 Waterlock / Muffler NLP375 Waterlock / Muffler NLP390 Waterlock/Muffler NLP31560 15L Dia. Waterlock/Muffler NLP31575 15L Dia. Waterlock/Muffler NLP31590 15L Dia. The NLP3 waterlock / muffler is the quietest in the world. Due to its unique three chamber construction the sound attenuation is an incredible 10 dB more than that achieved with a two chamber waterlock. No other waterlock in the market reduces the sound better. 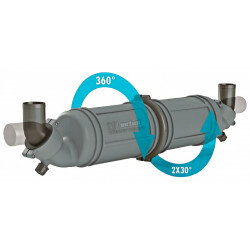 The NLP3 has rotatable chambers as well as rotatable hose connections, ensuring quick and simple installation in even the most confined spaces. 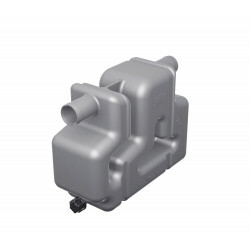 It is available with hose connections to suit internal hose diameters of Ø 40 mm, Ø 45 mm or Ø 50 mm. Provided with drain plugs for winter storage. Straps to secure the waterlock to the boat are supplied as standard. 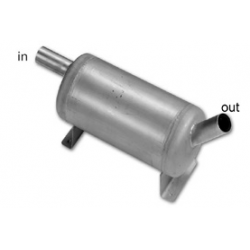 Page: Waterlock/Muffler NLP31560 15L Dia.